Born in Guanajuato on December 8th 1886. His family moved to Mexico City in 1892. He was a student at the Academia de San Carlos from 1895 and until 1905. Two years later he travels to Spain on a Scholarship financed by the Governor of Veracruz, Teodoro Dehesa and in 1909 he moves to Paris France. He returns to Mexico, exhibiting at his alma matter in 1910 but returns to Paris the next year. Rivera worked almost exclusively in cubism from 1913 until 1917, incorporating Mexican motifs in his work from 1914 on, and participates in major exhibitions throughout Europe. Between 1914 and 1915 Diego moved back to Spain and tours Europe searching for inspiration by studying the great masters of Italy in 1920. In the meantime he holds three exhibitions at Marius de Zaya's Modern Gallery in New York City. It was in 1921 that with the help of Jose Vasconcelos, Rivera returned to Mexico and started the Muralist movement. His first works were Creacion (1922-23) at the Escuela Nacional Preparatoria, the Frescoes at SEP (1923-28) and the ones at the Escuela Nacional de Agricultura in Chipango (1924-27). 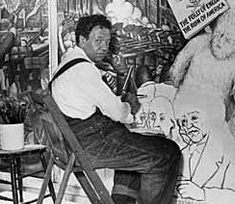 Diego Rivera held his first exhibition in Los Angeles in 1926, a year before his first visit to the Soviet Union. He became the Director of the Academia de San Carlos in 1930 and continued making murals. His first retrospective exhibitions were held at California Palace of the Legion of Honor in 1930 and at the Museum of Modern Art in New York in 1931-32. Between 1930 and 1934 he painted his first murals outside Mexico at the NYSE, California School of Fine Arts in San Francisco, Detroit Institute of Arts and the Rockefeller Center. This last one was destroyed for having communist undertones which created a huge controversy and was later reconstructed in Mexico at the Palacio de Bellas Artes. His first major retrospective in Mexico came in 1949 at the Palacio de Bellas Artes. Towards the end of his life, in 1955 and afflicted with cancer, he went to Moscow seeking treatment. He later returned to Mexico City where he died in his San Angel studio on November 24, 1957.